Goad the local do-gooder into killing you. Once you have reached level 17, offer a lion pelt to Molag Bal. In Brindle Home, goad Melus Petilius into attacking and killing you with Molag's Cursed Mace. Be resurrected by Molag Bal and receive the Mace of Molag Bal. No one will add the shrine's marker to your map for you. However, it is possible instead to be referred to Olyn Seran, one of the worshippers at the shrine who is also the Master Trainer for Conjuration. If the Conjuration Training quest is active, a quest marker will be placed near the shrine. The Redguard, Amir, at the shrine will tell you that you must offer Molag Bal a lion pelt (which can be obtained by slaying a mountain lion). Sometimes, lion pelts will appear in random loot sacks. At level 17 and higher, mountain lions will spawn outdoors in Farm, Plain, Rainforest, Highlands, and Mountain regions (see Outdoors Creature for a map of where these terrains can be found). They will also appear indoors in any caves or ruins occupied by animals; the closest good cave to check is Unmarked Cave. If you have not completed it already, the Fighters Guild quest A Rat Problem offers a guaranteed encounter with mountain lions, regardless of your level. Return to the shrine with the pelt and offer it to Molag Bal. Another mortal come to do my bidding. I only wish suffering and death. You will bring me both. I want to see a man brought to the edge. And pushed. Near Brindle Home you will find Melus Petilius. A good man. An honorable man. He disgusts me. He has sworn an oath: never to raise a weapon against another man again. I want him to break that oath, and damn himself forever. You will let him kill you with this: the Cursed Mace. As you are doing this for me, I'll save your miserable life. Probably. Get out of my sight. Molag Bal will tell you about Melus Petilius who has forsworn violence. You are to entice him into attacking you with the Cursed Mace (which Molag gives you). Petilius lives near Brindle Home in the deep woods to the southwest. Between 10 a.m. and noon he heads to his wife's grave. While he is at the grave, drop the Cursed Mace on the ground between him and the tombstone and attack him (e.g., hit him with a weapon, hand-to-hand or cast an aggressive spell). You must attack him while he is at the grave; it is the only place where he will pick up the mace. Attack him elsewhere and he usually will not respond with aggression, and definitely will not use the mace, even if you have dropped it in front of him. If he is at the grave, he will pick up the mace and attack you. Furthermore, he rarely picks up the mace if you drop it after you attack him; thus it is advisable to place it by him before you strike. Let Melus attack you until you die. It is advisable to save beforehand, however: there is a significant bug that may occur when he kills you. The bug notes provide tips on how to avoid triggering the bug. At the moment you die (after a loading screen), you will reappear at Molag Bal's shrine. Activate the shrine to receive your reward: the Mace of Molag Bal which absorbs strength and magicka upon strike. Well, it seems you've accomplished the task set out for you. Well done. Another man damned. Another ruined soul. But, you'll still get your prize, won't you? I think it was worth it... don't you? Keep up the good work, little mortal. Should you fail, however, you will get no reward and anger the Daedric Lord. You've failed, mortal. I didn't figure you had it in you. Weakling. Pathetic piece of filth. Leave, before I make you sorry you ever came here. Since being killed is a requirement to complete the quest, this would be a great opportunity to raise your Block skill. It is possible to sell or drop the cursed mace before attacking Petilius - on console versions there is no way to recover the mace if you lose it. Make sure not to take any followers with you as they might kill Petilius. Likewise, make sure to remove any form of reflect damage you might have active. There are a number of bugs in this quest associated with Petilius killing you. 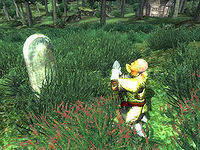 As a last resort, a player may bypass being killed entirely to prevent them. After Petilius makes his first strike against you, setstage DAMolagBal 60 may be entered into the console followed by clicking Petilius' body (still within the console) and typing stopcombat. The player may then return manually to the shrine and the quest should continue as normal. In this quest, Petilius is not actually supposed to kill you. The game just waits for your Health to drop below 20 points (regardless of how that happens) and then teleports you back to the shrine. As long as Petilius is doing "normal" amounts of damage, your health should never fall below 0. But if Petilius deals more than 20 damage in a single hit and kills you outright, it is possible for your death and resurrection to be beset by bugs. The best way to avoid/fix all such problems is to reload a save from before Petilius attacks you. Note: Petilius will only do more than 11 points of damage per hit when he does a power attack or if the game's difficulty is higher than the default value. 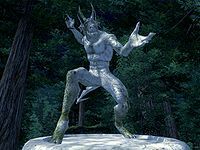 This issue has been addressed by the Unofficial Oblivion Patch; as the engine bug cannot be fixed by scripting, the fix is to prevent the player character from being resurrected. As the patch notes state, Molag Bal doesn't fully commit to saving your life. To avoid this bug, you just need to make sure that Petilius' last hit takes your health below 20 points, but not below 0 points. Make sure your health is at least 20 before you start the fight (i.e., if you damage yourself ahead of time to speed things up, do not lower your health too far). If you lower your health to 20 points, do not take any additional measures to speed up the quest, otherwise you are virtually guaranteeing that you will trigger the quest bug. When your health approaches 20, undo any actions you may have taken to increase Petilius' damage (put all of your armor back on, turn down the difficulty slider, etc.). Starting to block Petilius' blows when your health approaches 20 is an efficient way to prevent him from killing you with a power attack. Note that with the difficulty slider set to maximum, each of Petilius' hits will do 66 points of damage (more if he does a power attack). Therefore, the difficulty slider must be set to a normal level as soon as your health falls to 67 or less. If you are killed while knocked down, you will have no body when you are resurrected. To fix this bug, you can get yourself knocked down again or simply load a previous save game. Alternatively, you can save, exit Oblivion, and reload. This will sometimes reload the body mesh. If you are sitting in a chair when Petilius kills you, you will reappear sitting on thin air and unable to move. It's possible the cursed mace will be flagged as a quest item. This prevents you from dropping it to complete the quest. This can be fixed by entering setquestobject 26F98 0 into the console. For the console versions, your only options are to equip the mace and have an enemy disarm you, or to load a previous save. Occasionally, once killed, your Birthsign, Race and Fortify Attribute/Skill bonuses (eg. Night Mother's Blessing, Gray Prince's Training, Scales of Pitiless Justice, etc.) may be removed; and your fame be reset to zero. Your character may also be invisible. Bonuses provided by items can be retrieved by simply dropping them and picking them up again. However, this method doesn't work for all items and certainly can't restore racial and birthsign bonuses. Reloading a previous save is necessary. If you do not complete Molag Bal's quest correctly, Olyn the master trainer in Conjuration will not have the conversation option to complete the Conjuration master training quest. 20 Molag Bal has spoken to me, and wishes me to help him corrupt Melus Petilius, by forcing him to kill me with the Cursed Mace. I should travel to Brindle Home and see what I can find. 30 I have spoken to a resident of Brindle Home, who tells me that Petilius has lived in a small house outside of town since the death of his wife. 40 I have learned that Petilius visits the grave of his wife every day. 50 Although I tried to goad Petilius into fighting me, he would not. Perhaps I will have to try when he is in a different state of mind. 100 Finishes quest Molag Bal was pleased that I was able to corrupt the paladin. He has rewarded me with the Mace of Molag Bal. 105 Finishes quest I allowed Petilius to kill me, but he did not use the Cursed Mace. I have failed in the task given to me by Molag Bal. 110 Finishes quest Melus Petiliusis [sic] dead, so I cannot complete the task given to me by Molag Bal. It is possible to use the console to advance through the quest by entering setstage DAMolagBal stage, where stage is the number of the stage you wish to complete. It is not possible to un-complete (i.e. go back) quest stages. See SetStage for more information.